Designed to accommodate big and tall people, these 500 lb (227 kg) weight capacity chairs have extra wide, deep seats with thick cushioning to provide long-term comfort. They are rated for 24/7 use. 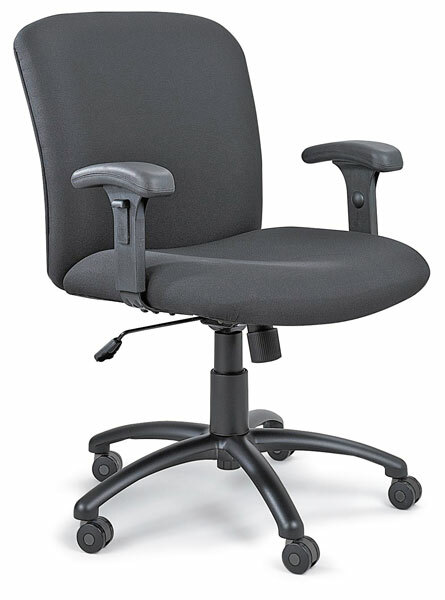 Features of the Uber Chair include a swivel seat with pneumatic height adjustment, tilt lock, and tilt tension. The sturdy five-star, oversized base with dual hooded casters adds extra stability. Adjustable T-Pad Arm Kit — T-Pad Arms adjust from 27½" to 34½ (from 70 cm to 88 cm). Height measured from floor. Fixed L-Arm Kit — The Fixed L-Arms are 28¼" (72 cm) from floor when attached to the Uber Chair. High-Back Uber Chair — This model offers added lumbar support and comfort. Greenguard Environmental Institute is an independent non-profit organization specializing in indoor air quality protection by certifying products and materials that meet approved standards for emissions. Products and materials certified under the Greenguard Children and Schools program meet the most rigorous standards to assure healthy schools and daycare centers.